Lets just get right to the answer for this week: I took a zero mile week, and though I stayed inside my Weight Watcher’s points, I’m not doing a weigh-in this week. I guess I was incubating a cold or something last weekend when I did my (brutal) 15-miler. Because almost instantly I got a nasty cough and basically headed straight downhill. I decided to rest for a couple of days and then pick it back up … and try to get my long run in … until I woke up on Thursday morning for my run. I basically went downstairs, called in sick, came back upstairs, and passed out. This makes me quite nervous, since the marathon is only like 9 weeks out … but this WAS a scheduled recovery week, and being able to hit the last 8 weeks healthy seems more important than these actual miles. So I made the active decision to just rest. Between that and the sickness, I won’t believe anything the scale tells me, so I’ll do the weigh-in next week. I’d rather now spend my time talking about something positive. I did feel a bit better today, though it was a nasty and rainy day outside. My poor 2-year old, who has also been under the weather, is finally well enough to be feeling cooped up … and it is a nasty January day and he is stuck inside. 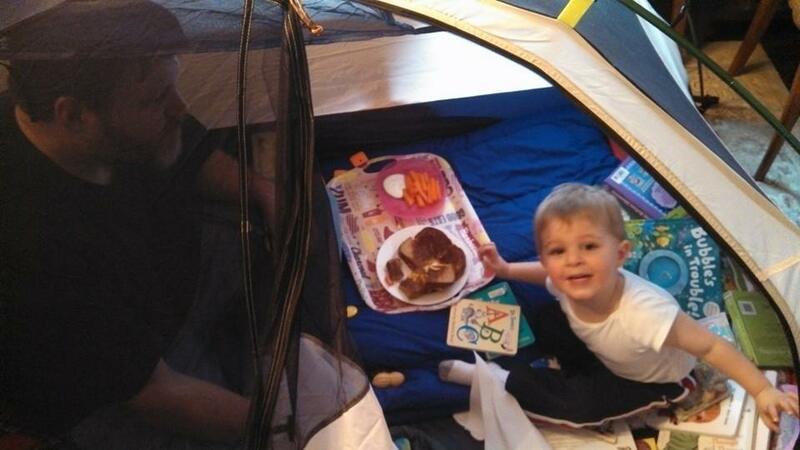 So we pitched my backpacking tent in the dining room. It was amazing. He was running around yelling “This is fun! 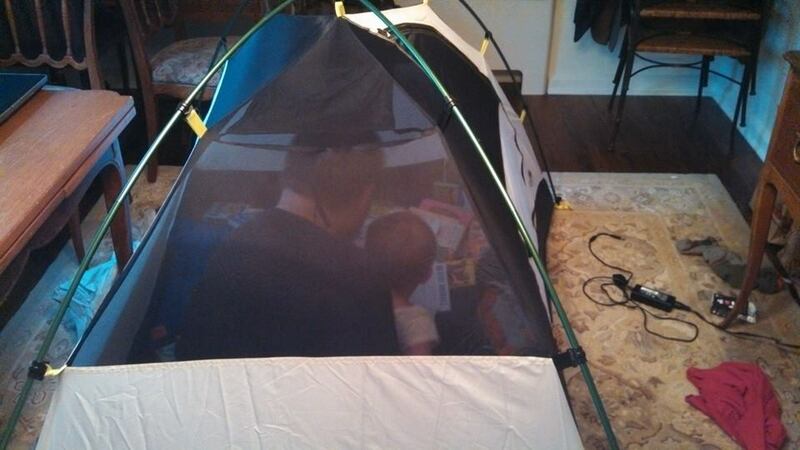 This is fun!” He put all of his books in there and we basically had to force him out for naps and baths and stuff. But I also began to notice something about me. The last time I used this tent, pitching it was a real chore. Getting in and out left me nearly out of breath. I couldn’t get comfortable inside … though it IS a two-man tent, and I was only one (very large) man. This time, though, it wasn’t bad. I was able to go in and out pretty effortlessly. And I was able to have a great day playing with a two-year old and not obsessing about my weight, or my breath, or … anything. Just doing it – completely doing it. It was awesome. I can’t wait until spring when we can go use that tent for reals. This is why I’m doing what I’m doing – THIS is why I’m putting in the work. Not for this week’s miles, and certainly not for whatever the scale was going to say. Real weigh-in next week. Promise.